Pork loin/cutlet (Pork chops are okay too!) – 450 g/ 1 lb. Cut off anything off the meat that you do not want and season it with salt and pepper. Begin to heat up your oil to about 170 C / 350 F. Only pour enough oil in to coat the bottom of the pan. You are not deep frying this! Also, keep an eye on it to make sure it does not spit! Pour your flour and panko into separate bowls or plates. Either works just fine. Beat or whisk your egg in a bowl. Generously coat the pork with the flour. Dip the flour coated pork into the bowl with egg covering it completely. Next, roll the egg covered meat into the Panko bread crumbs. Fry the cutlet. Cook till both sides are golden brown. If you’re not sure if it is cooked all the way through, simply cut one in half. If it’s cooked, dig in! 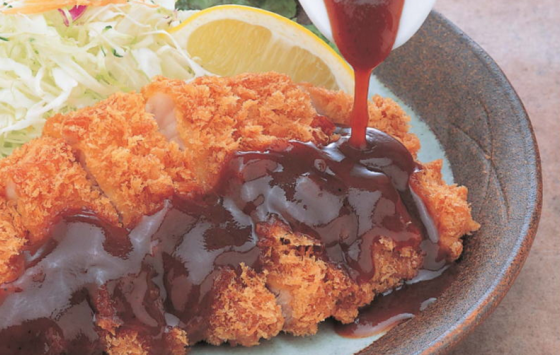 Ketchup, sweet soy sauce, or plain tonkatsu sauce will go great on it! Doesn’t this just look amazing? Don’t you want to tear right into it? This is a delicious meal that is usually paired with rice and a salad to make a lunch or dinner. 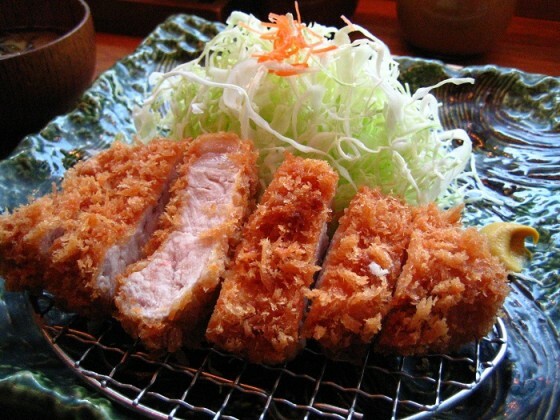 There are two other dishes that go great with tonkatsu! One is curry. However, you should try making the omurice from last week. They are like a pair of buddies. Plus! They can both be consumed with ketchup so it’s two birds with one stone. This would be the ultimate lunch combo.I hope you enjoyed this article! Please let me know if you succeeded in making these recipes in the comments below. If you did, let me know if there is a food from an anime that you want me to write about and I’ll be more than happy to try and write up a recipe about it. Till next time!